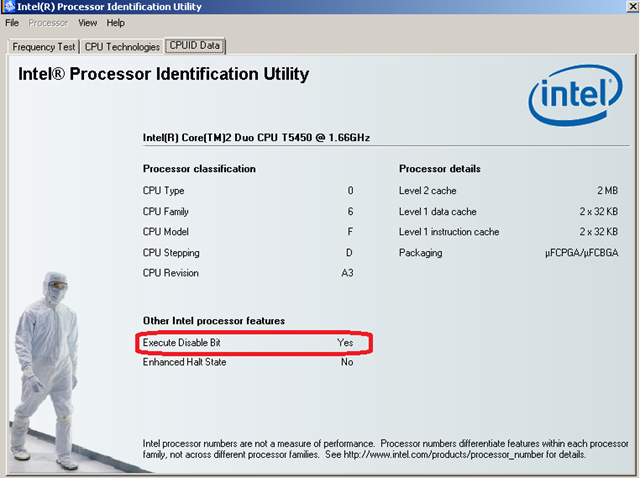 Will my current processor will support hyper v? Right now all IT world is migrating slowing to virtualization. I though i should also experience a virtualization technology. As I am working on Microsoft technologies, I choose Microsoft Hyper-V and not to go for other virtualization platform. After deciding on virtualization platform, first question came in my mind that whether my current computer will support Hyper-v or not ? After searching a lot on the web, i came across the Taylor Brown’s Blog, where he talks about about the Hyper-V and Virtualization. 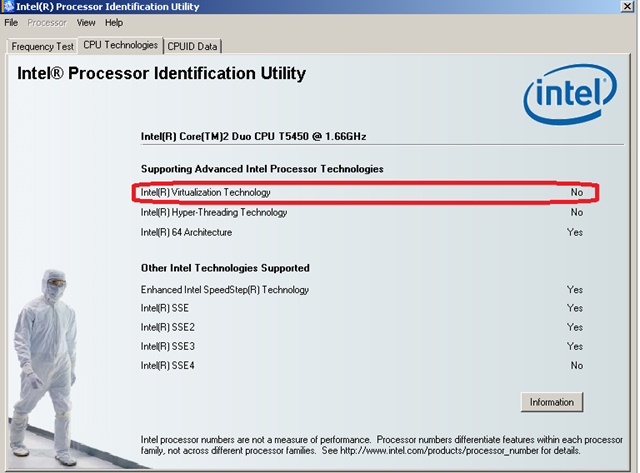 As my current processor is from Intel, I have downloaded Intel® Processor Identification Utility to check whether my processor support Hyper-V or not. After running the utility I got to know that my current CPU doesn’t support Hyper-V and i have to buy new computer!!! What is this ‘execute disable Bit means”? Intel’s Execute Disable Bit¹ functionality can help prevent certain classes of malicious buffer overflow attacks when combined with a supporting operating system. Execute Disable Bit allows the processor to classify areas in memory by where application code can execute and where it cannot. When a malicious worm attempts to insert code in the buffer, the processor disables code execution, preventing damage and worm propagation. Replacing older computers with Execute Disable Bit-enabled systems can halt worm attacks, reducing the need for virus-related repairs. In addition, Execute Disable Bit may eliminate the need for software patches aimed at buffer overflow attacks. By combining Execute Disable Bit with anti-virus, firewall, spyware removal, e-mail filtering software, and other network security measures, IT managers can free IT resources for other initiatives. Abhishek Joshi having 8 years exp. in IT Industry and 5 exp in System Managment. Between Oct 2009 to Oct 2011 Abhishek was the only MVP in India for SCCM 2007 technology. Abhishek has started his online carrier from Blogcastrepository.com in Dec 2006 and post that actively participated on Technet forum.